Every time I travel, I always tell myself I should organise my life so that I can travel more. I love visiting new places, especially if I can get the chance to see those places through the eyes of a resident (so I get all the local gen and don’t feel entirely like the crass tourist I really am). Every experience is better enjoyed fully in context - and particularly the food. Nothing makes the food more special than a good story. I exist in this constant contradiction. I value locally sourced foods cooked in the local tradition - which is sustainable and gives you the sense of your own place. But equally I love trying out, and learning from, all the different and amazing cuisines from across the world. 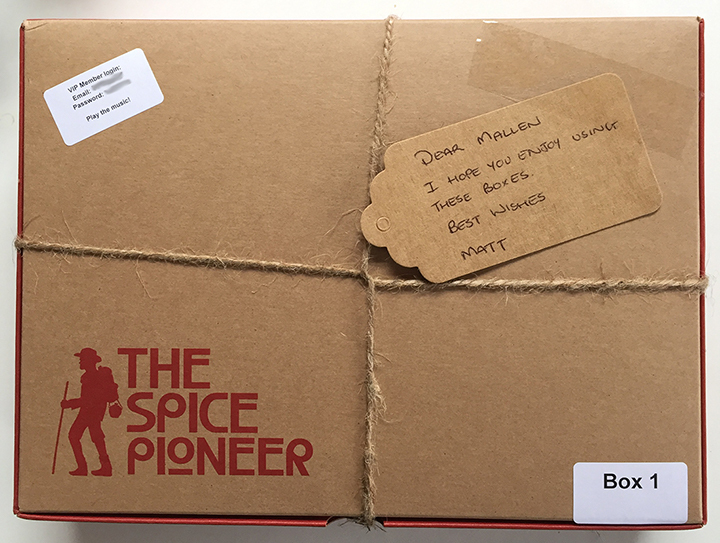 So I was delighted when The Spice Pioneer invited me to sample two of their boxes for the purposes of review. It produces a new box every month, focused on a particular country. The boxes give you all the spices you need, plus a nicely produced recipe card and a little "postcard" from the place itself - telling the traveller's tale behind the meal that you’re about to eat. Not only that, you get a login that will give you a Spotify playlist of music appropriate to the country as well, so you can really absorb yourself in the ideas, sounds and scents. This isn’t just a meal, it's an occasion. I’ve been interested in mail order meal services for some time. In theory, if you want to eat well and you’re keen to waste less, getting ingredients that have been exactly portioned for you is the way to go. This, however, doesn’t include any of the fresh ingredients - it just includes the spices. And the recipes. And the music. And the story. The key thing, then, is how good are the recipes? Are they easy to cook, and do they deliver something on flavour that justifies all the focus on the spice components? I tried them in order. 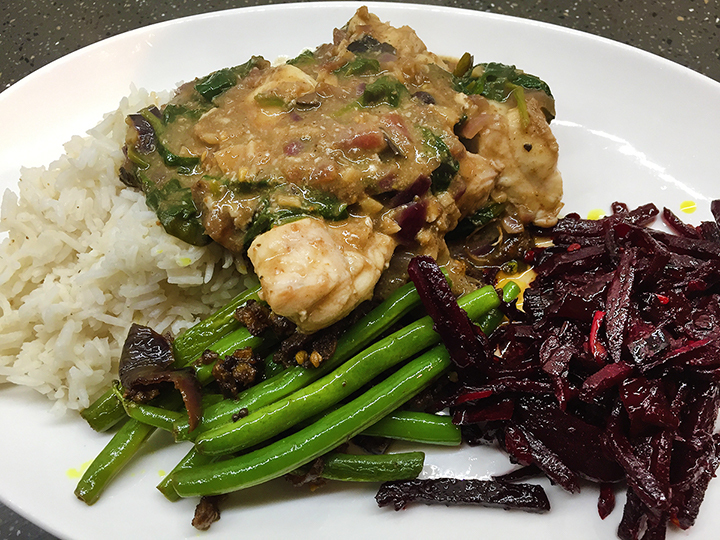 The first meal was Sri Lankan - a monkfish curry, with green beans and beetroot curry. The one thing each of the components had in common here was fenugreek seeds - which was a spice I know I have in my cupboard, so I obviously used it for some recipe once - but it is one that I’m certainly not in the habit of using regularly. It also had a couple of spice blends unique to the country and this recipe - so it would be hard to rush off and redo the meals without some considerable research and probably expense on lots of different spices to go in the blends. It also had curry leaves (which I rarely have) and tamarind paste (which I never have). That’s the real value of this approach. The instructions are straight forward, and easy to follow. These are not quick insta-meals. They take maybe half an hour to prep, and then over an hour to cook in total, depending how fast you are in the kitchen. For me, that’s a plus because obviously I like to cook. I can look at a recipe with numerous components and be excited to work my way through it. The recipe card might be a little daunting for the unconfident cook but then, to be fair, that’s probably not the target market. The one thing I thought was missing from the recipe card was instructions on how to prep and handle the monkfish. I’ve cooked with monkfish before so know to remove the dark membrane before cooking, but if this had been my first time I could easily have missed such a detail. But focusing on such things feels churlish because when it came to flavour, the Sri Lankan meal delivered big-time. The monkfish curry was one of the most flavourful curries I have had, ever. As simple as that, and it’s not as though I’ve spent my life avoiding curry. Each of the components - the green beans, the beetroot, also were distinctive and special. It was simply a fab meal. So far so good. Could The Spice Pioneer deliver again for meal two, or was that a beginners-luck one-hit-wonder? Meal two was Moroccan. 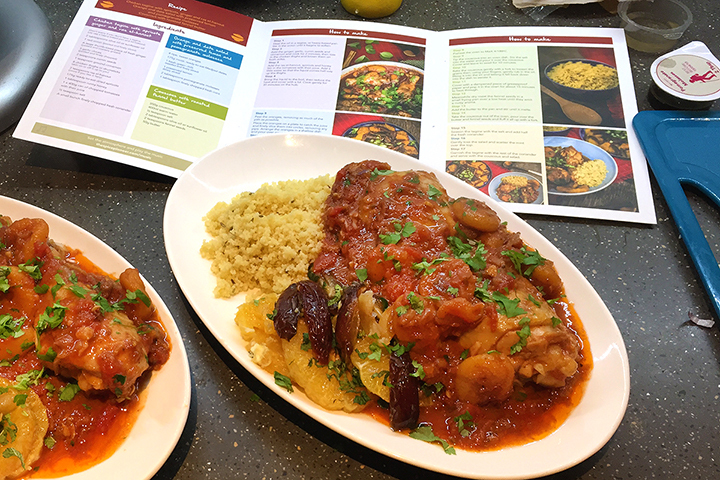 Chicken tagine with apricots, ginger and ras-el-hanout, orange and date salad with preserved lemon and pomegranate molasses, and couscous with roasted fennel butter. Again, it was simple to cook. You just work your way through the steps in the order it gives them. There are no little ‘gotcha’ moments when, if you’d failed to read ahead you’d get caught out with something you should really have done at an earlier stage. So long as you did all the prep in advance - all the chopping and slicing - then it was stress-free and easy to work your way through and cook the food as intended. 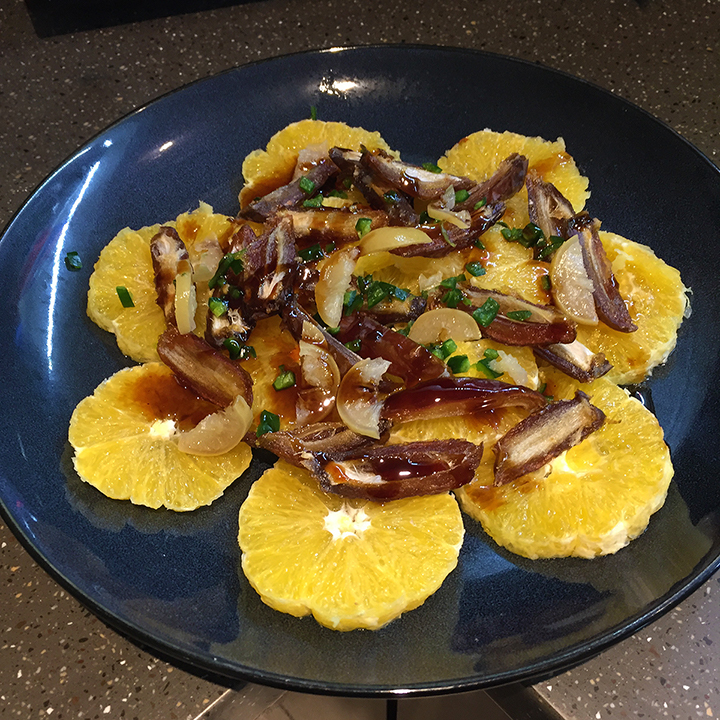 The component I had my doubts about was the orange salad with medjool dates sliced and put on top, slices of fresh green chilli, preserved lemon and then drizzled with pomegranate molasses. It sounded like it would be mostly about some slices of orange, and I thought that would be a bit of a let-down on the place. However, the synchronicity of the pomegranate molasses, given that I’d recently bought some and have been looking at different ways to use it, was fantastic. So I went ahead as it said and decided some basic trust was in order. The final meal was every bit as good as the first one. 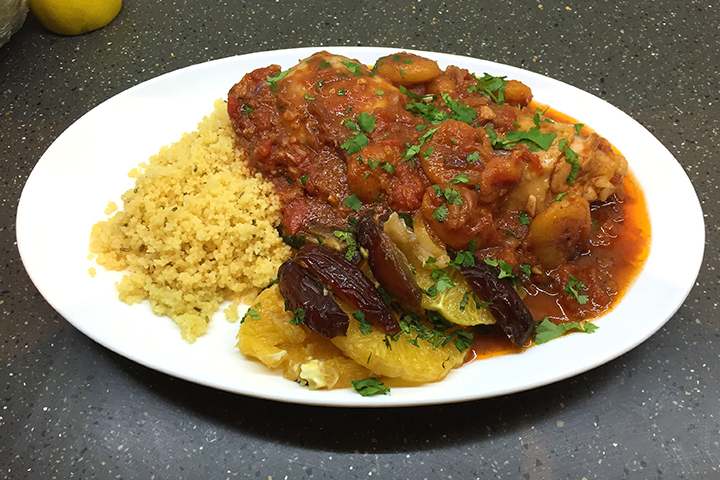 The tagine had a superb flavour with the fantastically fresh and aromatic ras-el-hanout that had gone into it. The orange salad had a great mix of flavours with the addition of the dates and the earthiness that the pomegranate molasses gave it. And even the humble couscous, having had a little oil and butter mixed into it along with freshly dry-toasted fennel seeds, had that extra something I’m not used to getting from a pile of couscous. It was delicious. Plain and simple. And if they can maintain this standard, The Spice Pioneer should go from strength to strength. It may be because you get all the right spices to work with and they’re all fabulous and fresh. It may be because they’ve taken care to get some of the recipes that show the spicing off to best effect. It may be all the paraphernalia around it, which you can dismiss as irrelevant extras if you want, but for me definitely adds to the ‘dip-into-this-country’ experience. It worked well enough for me that I decided after the second meal to actually sign up. As a once-a-month exercise, dipping into a different national cuisine, it just works brilliantly well. And in principle it’s a great waste-free way to get the spices you need to do it. I say ‘in principle’. The one natural drawback of such services is that - and this hard to avoid for a start-up business - it has had to make a decision for you re. numbers of diners. Each box gives you enough spice for a meal for four. I was cooking for two. Scaling down the recipes was fine. But obviously, you end up with half pots of spice left over. And the pots are not naturally resealable - so you then have limited time to use the remaining spice while it’s still fresh. The portion sizes they plan for with their recipes are quite generous, so if you’re cooking for five you could do that with the recipes as printed. From a sustainability viewpoint, the box and all the packaging was recyclable. And if you’d done the full recipe, there wouldn’t have been much in the way of leftover ingredients to potentially become food waste (for my slimmed down version, I had half an onion, two-thirds of a bag of dried apricots, most of a bag of fresh mint, and three medjool dates). They have done such good attention to detail, just a little additional note on how to store, and ideas to use up, any potential left-over ingredients would surely be just that extra icing on the spiced cake? The Spice Pioneer hasn’t suddenly appeared from nowhere. It’s an offshoot brand of the long-running spice company ‘Seasoned Pioneers’. It clearly benefits from the long decades’ worth of experience. The cost is £9.00 a month. In theory, an expensive way to buy the quantity of spice you get. But in practice much cheaper than buying jars of all the different spices and then leaving half of them in the cupboard until you throw them out. And besides, so much more than just the spice. So much attention to detail has gone into making it an experience of a different culture. My wholehearted recommendation is that you should give it a try. You won’t be sorry. * The Spice Pioneer provided two boxes without charge for the purpose of this review.